"Beatlesque" (/ˌbiːtəlˈɛsk/) or "Beatles-esque" describes a musical resemblance to the English rock band the Beatles. The term is loosely defined and has been applied inconsistently to a wide variety of disparate artists. "the big ending", as in "It's All Too Much"
a simulacrum of the Beatles' reputed sound that ultimately means nothing ("a copy without an original)"
Toronto Star's Jack Sakamoto has commented: "[some people's] notion of that sound includes everyone from Panic! at the Disco to Billy Joel to the Red Hot Chili Peppers. With those reference points, it's debatable whether the Beatles themselves would qualify for the adjective their music has spawned." Culture Sonar's Scott Freiman argued that anyone who is "Beatlesque" has "got to be a band— not just a singer/songwriter with a backing band... [but having] multiple songwriters and multiple vocalists." Notable acts described as "Beatlesque"
Badfinger – The first artists to sign with the Beatles' Apple Records. Their songs "Come and Get It" (1969), "No Matter What" (1970), and "Day After Day" (1971) were produced by Paul McCartney, Beatles road manager Mal Evans, and George Harrison, respectively. Big Star Though the American band attracted critical acclaim for its Beatles-influenced work in the 1970s, its life proved contentious and short. The Guardian later commented that it was "good, classic, and successful in replicating the sound, but not the commercial success." The Byrds – Sometimes regarded as the "American Beatles". While the Byrds' long-term influence has proven to be comparable to that of the Beatles in terms of sound and style, the Byrds failed to match their contemporaries' record sales. Cheap Trick – Also sometimes known as the "American Beatles". In addition, the group's 1980 album All Shook Up was produced by longtime Beatles producer George Martin, and the group's live performance of Beatles songs culminated with a full orchestra backed live album, titled Sgt. Pepper Live (2009). Electric Light Orchestra – Formed explicitly with the intention of "picking up where the Beatles left off", the outfit has proved one of the few Beatlesque groups to achieve sustained commercial success. As well, frontman Jeff Lynne has maintained a long career with individuals formerly of and associated with the Beatles. In the early 1970s, John Lennon praised the band as "sons of Beatles" and cited their 1973 song "Showdown" as a personal favorite. Klaatu – Falsely rumoured of being the Beatles themselves, reformed. 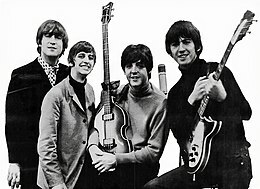 The band is sometimes known as the "Canadian Beatles". Oasis – Their Beatles influence was labelled as an "obsession" by British media. During their 1991 to 2009 career, the band's widespread success in terms of culture and social reach caused it to be possibly the most popular band since the Beatles. Squeeze – The British band's duo of songwriters Chris Difford and Glenn Tilbrook have attracted comparisons to the Lennon–McCartney partnership. Look up beatlesque in Wiktionary, the free dictionary. ^ a b c d e f g h Sakamoto, John (1 November 2013). "What do we really mean by 'Beatlesque'?". Toronto Star. ^ a b c d e f g h i j k l Freiman, Scott (November 12, 2016). "15 Bands Following in the Beatles' Footsteps". CultureSonar. Retrieved January 3, 2019. ^ a b c "ELO: The band the Beatles could have been". The Guardian. 16 October 2008. Retrieved 9 December 2014. ^ Inglis, Sam (2003). Neil Young's Harvest. Bloomsbury Publishing. p. 12. ISBN 978-1-4411-8896-0. ^ Kemp, Mark (2006). Dixie Lullaby: A Story of Music, Race, and New Beginnings in a New South. University of Georgia Press. p. 27. ISBN 978-0-8203-2872-0. ^ Schinder, Scott; Schwartz, Andy (2008). Icons of Rock. Greenwood Press. pp. 257–258. ISBN 978-0-313-33846-5. ^ a b Szczechowski, Joe (October 21, 2015). "Cheap Trick's five most underrated songs". Axs.com. Retrieved December 26, 2018. ^ Young, Clive (2004). Crank It Up: Live Sound Secrets of the Top Tour Engineers. Hal Leonard. p. 167. ISBN 978-1-61774-510-2. ^ Glassman, Julie (30 November 2001). "The Beatles' musical footprints". BBC News. ^ Stephen Thomas Erlewine. "Squeeze | Biography & History". AllMusic. Retrieved January 3, 2018. ^ Crouse, Richard (2012). Who Wrote the Book Of Love?. Doubleday Canada. p. 108. ISBN 978-0-385-67442-3. ^ George, Nelson (2003). The Death of Rhythm and Blues. Penguin Publishing Group. p. 165. ISBN 978-1-101-16067-1. ^ Unterberger, Richie (2003). Eight Miles High: Folk-rock's Flight from Haight-Ashbury to Woodstock. Backbeat Books. pp. 39–. ISBN 978-0-87930-743-1. ^ Unterberger, Richie. "Por Favor! - Los Shakers". AllMusic. Retrieved May 10, 2017. ^ Riley, Tim (2002). Tell Me Why: A Beatles Commentary. Da Capo Press. p. 340. ISBN 978-0-306-81120-3. ^ Johnston, Richard (2004). How to Play Rhythm Guitar: The Basics & Beyond. Backbeat Books. p. 63. ISBN 978-0-87930-811-7.